HMD Global has announced that they are launching the Nokia 3, the Nokia 5 and the Nokia 6 in India and the Nokia 3 will launch first. The company will start selling the Nokia 3 in India shortly and will then launch the Nokia 5 and Nokia 6 later on. The Nokia 3 comes with a 5 inch display with a HD resolution of 1280 x 720 pixels and it features a MediaTek MT6737 processor and comes with 2GB of RAM and 16GB of included storage. Othet specifications on the handset include an 8 megapixel front camera for Selfies and an 8 megapixel rear camera with an f/2.0 lens. 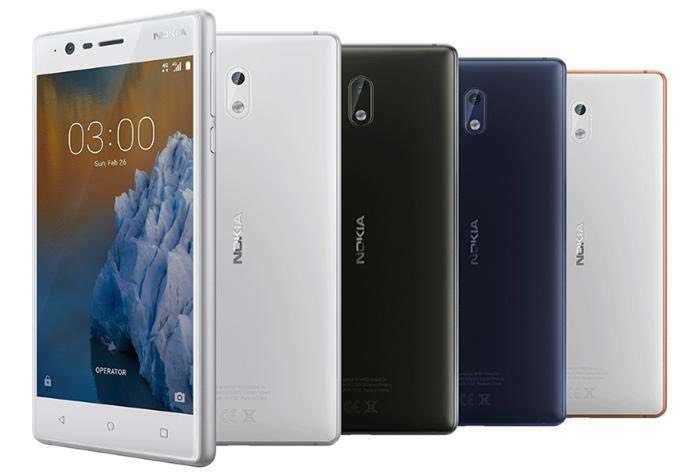 The handset also features a microSD card slot if you need some extra storage and it comes with 4G LTE, WiFi and Bluetooth, it also features the latest version of Google’s mobile OS Android 7.1.1 Nougat.The Nokia 3 will retail for INR 9,499 which is about $148 at the current exchange rate.